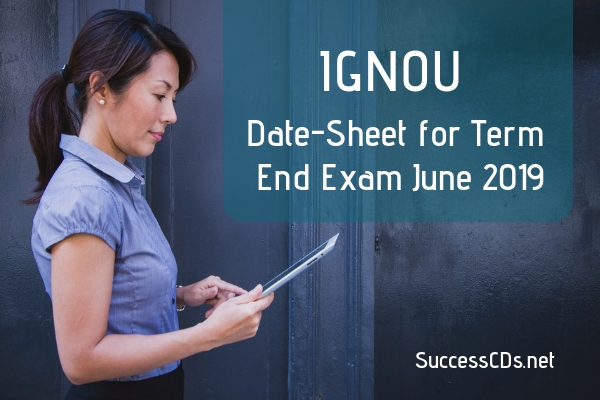 IGNOU Term End Exam June 2019: The Indira Gandhi National Open University has begins the Application process for Term End Exam (TEE) June 2019 on its official website. As per the notification candidates can fill the online Exam Form for IGNOU Term End Exams June 2019 through the official website from March 1 to 31, 2019 without late fee and with late fee of Rs. 1000/- from April 1 to 10, 2019. IGNOU, India’s Top Distance Learning University conducts the term end examination every 6 month for all courses in the months of June and December. Hall Ticket will be uploaded on the University Website 10 days before the commencement of the Term-end examinations. Please take print out of Hall Ticket from University website (www.ignou.ac.in) and report at the Examination Centre along with the Identity Card issued by the Regional Centre/University. Examination results of Term End Examination (TEE) December, 2018 are available on University website (www.ignou.ac.in). Please click here to see result status of December, 2018 before filling Examination Form. Students who's TEE December, 2018 results are not declared yet, they need not to wait for results. They are advised to fill the Examination Form for TEE June, 2019 on or before last date of submission of Exam form as per schedule above. Select Examination Centre Code from the options available on the website. list of Regional Centre wise Examination centres for Term-End Examination June-2019 is available for information. If the Examination Centre opted by the student is not activated as Examination Centre or not allotted for administrative reasons, alternative Examination Centre will be allotted to the student. Select course(s) carefully while filling the Examination Form as per your valid registration details available in IGNOU website. Courses for theory as well as practical needs to be selected separately from the list appearing on the screen for filling the Exam form. After successful submission of Examination Form, you will receive an acknowledgement with Control Number on the screen. Please retain the auto generated Control Number for your reference and record. For checking Examination Form status please visit SEARCH OPTION after 72 hours of submitting the Form. Details regarding examination form submission are not available, you may submit the form again only after following the due procedure as listed above.